M92 is another beautiful globular clusters in Hercules. 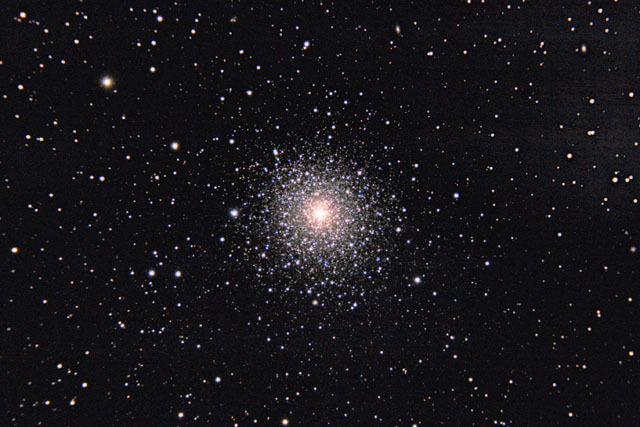 Because the constellation of Hercules also contains M13, M92 is often forgotten. While not as impressive as M13, M92 shines at a visual magnitude 6.3 - bright enough to see with the unaided eye in very dark skies. M92 subtends 14 arc minutes, about 1/2 the diameter of the Moon. Software Used Images Plus 4.0 for camera control, calibration, stacking and digital development. Photoshop CS5 used for flat fielding, curves, color correction, saturation adjustments, shadows and highlights, and high pass filter. HLVG for additional color correction, Carboni Actions for additional saturation adjustments. Notes The focal reducer I used appears to not flatten the field at all, so this is a crop from the full frame. I am very happy with the final result, as I think I ended up with a pretty sharp image with good colors as well.